If you’ve been putting off purchasing a pair of slippers to traipse around your flat in because you’re used to seeing options like these, we feel your pain. Thanks to Loro Piana, you can break free from those fleecy monstrosities that plague big box retailers and slip into something more luxurious. 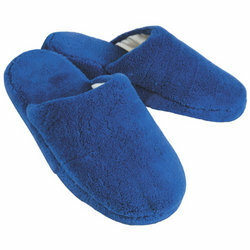 While advertised as a “plane slipper” these will easily play double-duty as an around the house home for your feet. And bonus, these feature an anti-slip suede sole. So if you spill some milk on the floor, you won’t end up in this situation. Comfort — check. Stylish — check. This entry was posted in Footwear, Uncategorized and tagged Loro Piana. Bookmark the permalink.